One of my favorite things about being a mom is all the fun crafty opportunities you don't normally get to do as an otherwise average adult. My oldest kid is only three, but I can't wait until she has to make a solar system from styrofoam or a plant cell out of fuse beads or something. Call me a nerd, but those kinds of projects get me so excited! I remember building a fully furnished shoebox condo for two stuffed lizards as a kid, but once I built it, I never played with it. The creating was the best part for me. 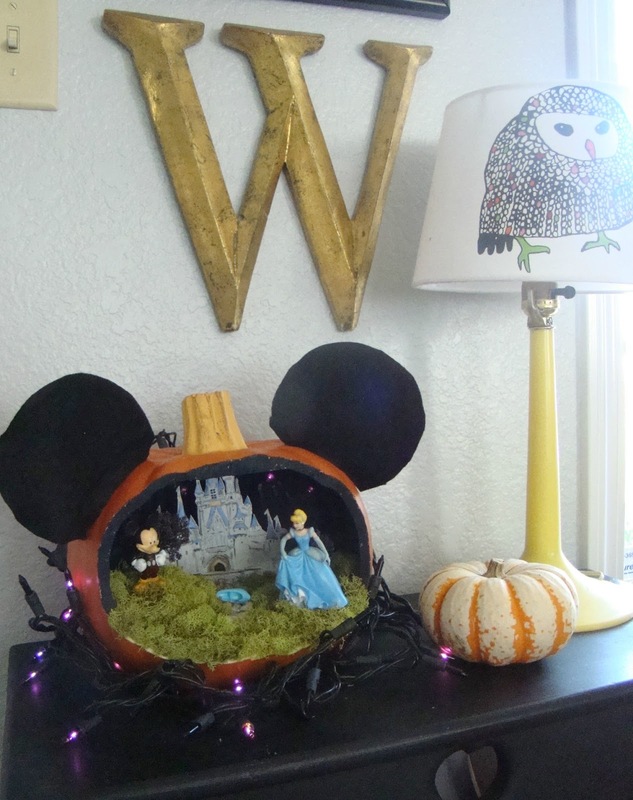 So this year, when our daycare announced their fall festival pumpkin decorating contest was open to all ages, I was pumped! This could be my time to shine! 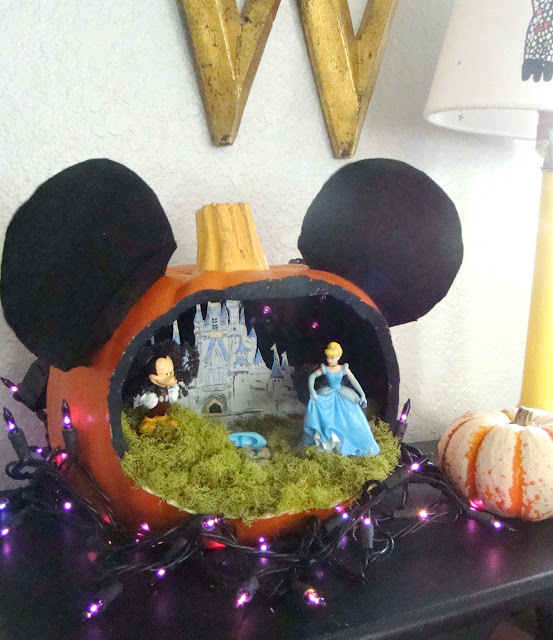 Originally, I thought I thought about carving or decorating a real pumpkin. I even pinned a few ideas, but nothing was getting my crafty juices flowing. Then I stumbled across this tutorial, and inspiration struck! 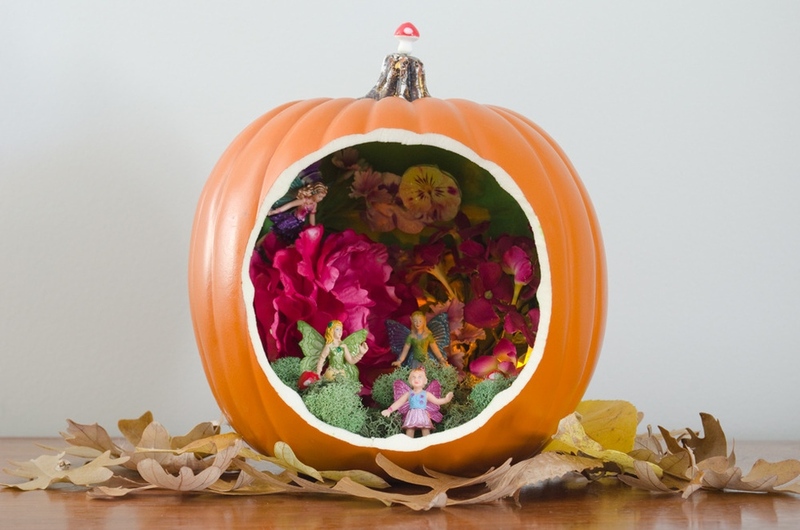 I loved the quirkiness of the old-school diorama, and I was excited about creating an entire scene inside my pumpkin instead of just a character. My daughter's class at daycare is known as "The Jungle," so I originally thought I would create a scene with monkeys and tigers and lots of green leafy trees. But that felt a little too on the nose, and I wasn't crazy about it anyway. 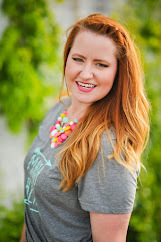 So I decided to do what I normally do when I want to be inspired - I zoned out on Facebook ;). It was Fall Break around here, and basically my entire friend list was living it up in Disney World. I was feeling jealous (we haven't been to Disney since our honeymoon eight years ago! ), but then the inspiration did hit! 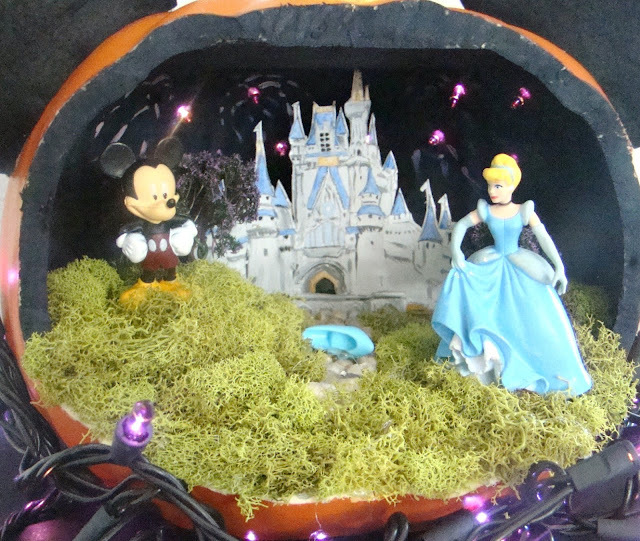 Cinderella and her castle IN A PUMPKIN! It's like the dream inside the dream inside the dream from Inception! When I got that buzzy feeling inside my brain that happens when the ideas start bouncing around, I knew my theme was perfect! I picked up a carve-able foam pumpkin at Target, and some moss, pebbles, styrofoam shapes, air-dry clay, and tiny trees from Hobby Lobby. Side note: I am in the Hob Lob at least once a week, and I really thought I had the floor plan of that place memorized. But I had no idea they have an entire aisle dedicated to dioramas! This is not good news for me. Tiny cute trees and plants and miniature stuff I can glue to things!? I'll be visiting that aisle again soon. I also borrowed a couple of my daughter's Disney figurines to set the scene, and a string of lights (purple per her request). I didn't take any pictures of the process because I just get too in-the-zone to stop and photograph stuff. But after cutting an opening in my pumpkin, I painted the inside a midnight blue. Then, I hot-glued my styrofoam pieces to the bottom, and covered it all in Crayola Air Dry Clay. This gave me a good base to stick all my pieces into. The most time-consuming part was sketching and painting Cinderella's castle. I'm not trained at all as an artist, so I just look at a photo and do my best to copy it. After it was painted, I decoupaged the castle to a thin piece of cardboard to make it feel substantial, and used small wooden sticks to push it down into the clay and styrofoam. It was starting to come together! I stuck in the trees with floral wire, hot-glued the moss down, then added the pebbles for a cobblestone walkway. I also hot-glued most of my skin in the process. 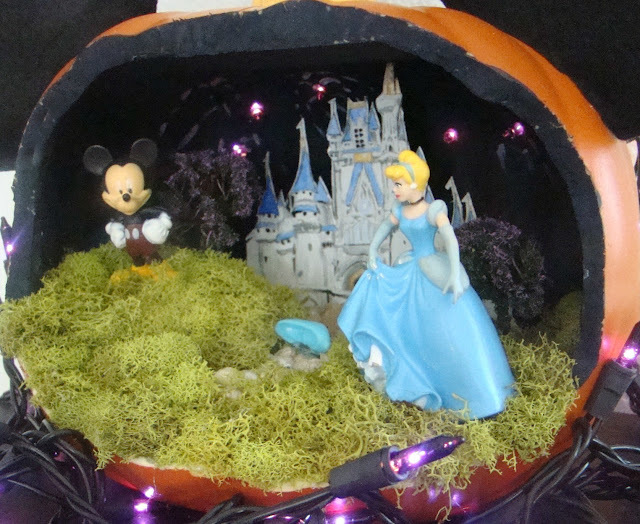 Then Cinderella and Mickey Mouse himself got glued down. The last step was to drill holes for the lights and add details for the fireworks. At the last minute, I decided to add the mouse ears to the top to help disguise all the wires from the lights. I'm not 100% crazy about how they look, but they will do. To my surprise, the string lights blink! I think that added to the fireworks effect. It's not perfect. Some of the edges are rough, and you can see a lot of glue dots, but this was seriously the most fun I've had doing any kind of project in a long time. Plus my crap photography skills are not doing it justice. It almost makes missing out on the Disney World fun okay (pssh, not really)! Now I'm inspired to make all kinds of Fall-themed dioramas. I'm thinking little forest animals, fall leaves and acorns...the possibilities are endless! What do you think about the diorama idea? Have you been to Disney lately? I hope I my kid wins the decorating contest!